When you’re stressed, like you might be during a confrontation or when you’re running late, it’s normal for your blood pressure to run a little higher than usual. It’s what’s “usual” that you need to concentrate on, and you want your usual blood pressure to be in the normal range or lower. 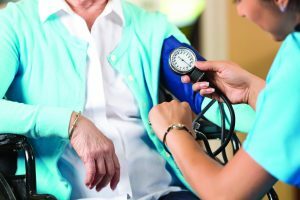 Recently, the American Heart Association and the American College of Cardiology released new guidelines that lower the threshold for what can be considered hypertension, or high blood pressure. The guidelines are based on an individual’s risk for heart disease. By the new standards, tens of millions of Americans should be treated for high blood pressure. To understand the importance of keeping your blood pressure at a healthy level, it helps to understand what blood pressure is and how it’s measured. Simply put, blood pressure is the force of blood pushing against the walls of the blood vessels in the heart when it beats. When blood pressure is measured, it is recorded as two numbers, one on top of the other. The top number is the systolic pressure, which is the pressure in the arteries when your heart is contracting to pump blood out to the body. The bottom number is the diastolic pressure, and that’s the pressure in the arteries when your heart relaxes between beats. As you might expect, the systolic pressure should be higher than the diastolic due to the force of the pumping. Too much pressure during either phase of the heartbeat can damage the blood vessel walls and lead to serious, even deadly, conditions. These include heart attacks and strokes. In general, normal blood pressure is a systolic reading of 120 or lower and a diastolic of no more than 80. Systolic pressures of 120 to 129 are considered elevated, and are risk factors for hypertension. High blood pressure is a pressure of 130 or higher systolic or higher than 80 diastolic that stays that way over time. 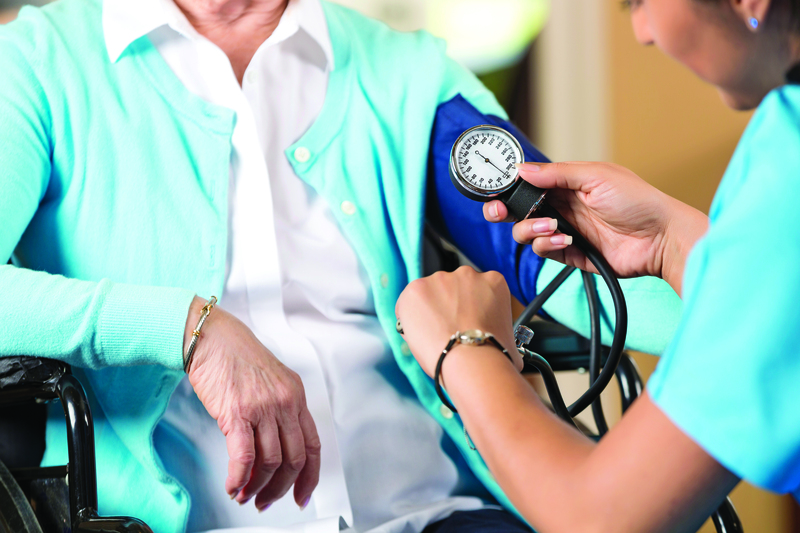 There are some risk factors for developing high blood pressure that cannot be controlled, such as having a family history of high blood pressure and getting older. There are other risk factors that you can control, such as smoking, being overweight, eating an unhealthy diet and being physical inactive. Most doctors take your blood pressure every time you go in for an appointment. If your blood pressure is high on two or more readings done on two or more occasions, you are typically diagnosed with high blood pressure. However, the new guidelines set by the AHA and ACC look at overall risk for heart attack and stroke in determining when a person should be diagnosed with high blood pressure. They suggest anyone with a 10 percent or greater risk in the next decade should be treated. Using their formula, that works out to about half of all Americans and 80 percent of those over age 65. To determine your risk, you can use an online calculator such as this one. Since so many of the risk factors for high blood pressure can be controlled, treatment generally begins with lifestyle modification. Many times, taking steps such as quitting smoking, achieving an appropriate weight, eating a nutritious diet, limiting alcohol consumption and becoming more physically active is enough to reach and maintain a healthy blood pressure. Other times, people need to add medication to their healthy lifestyles to control their elevated pressures. These drugs help the body rid itself of excess water and sodium, which decreases stress on the blood vessels and lowers pressure. ACE inhibitors. ACE stands for angiotensin-converting enzyme. ACE inhibitors help the body produce less angiotensin, a chemical that causes the arteries to narrow. With less angiotensin, blood vessels relax and widen, enabling freer flow of blood. Beta-blockers. These medicines reduce heart rate, and the heart’s workload and output of blood. Calcium channel blockers. These drugs prevent calcium from entering the smooth muscle cells of the heart and arteries. Without a lot of calcium acting against it, the heart doesn’t have to contract as forcefully. Vasodilators. Also called blood vessel dilators, these medications cause the muscles cells in the walls of the blood vessels to relax, allowing them to widen. High blood pressure has no symptoms, and it’s often called a silent killer. That’s why it’s important to visit your doctor regularly, so he or she can keep an eye on your readings. Of course, you don’t need your doctor’s advice to make positive lifestyle changes. Quitting smoking, eating heathy and exercising is good for everybody!